torm when you notice a large branch that has broken off and is now stuck in another branch overhanging you house, or maybe it will be a month from now when your tree is still hanging onto its leaves are you are worried that something might be wrong with it. When that happens you will be poised with the decision of whether or not to hire a certified arborist to help you with your tree care needs. Certified Arborists are individuals who have achieved a level of knowledge in the art and science of tree care through experience and by passing a comprehensive examination developed by some of the nation’s leading experts on tree care. Certified Arborists must also continue their education to maintain their certification and adhere to a Code of Ethics. Therefore, they are more likely to be up to date on the latest techniques in arboriculture. Quality tree care is something that can provide substantial returns and is something that should not be taken lightly. A properly maintained tree can add substantial value to you property and bring a lifetime of happiness to many. However, a tree that is neglected or worse yet, incorrectly cared for can become a very serious hazard as well as an unsightly eyesore. When you hire a certified arborist you can guarantee that your tree care will be of the latest techniques and developments as well as done in the safest way possible. Tree care can be a very dangerous job and should only be preformed by those trained to work under such conditions, something that a certified arborist is likely to be. tree for the placement and the environment that you are looking to plant a tree in. 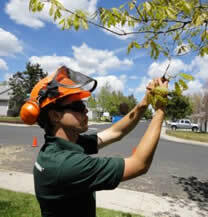 However, their biggest skill is their knowledge of tree health and their ability to diagnose your tree problems. Unlike a doctor working on a patient, an arborist isn’t able to talk to the trees to find out what is wrong with them. Instead they must rely on knowledge and experience to look for signs that might lead them to the answer of the trees problems. doctor, just the same if something is wrong with your trees you should hire a certified arborist. They have the most current information on quality tree care, and are guaranteed to be will educated in tree care. So the next time you have a tree care need be sure to visit the ISA website and find yourself a certified arborist in your local area.